Refuelling with DriveNow in Helsinki- Start earn bonus minutes! You usually don't have to worry about refuelling with DriveNow. Normally, you simply jump into your BMW or MINI, enter your PIN and set off. However, if your tank does happen to be less than 15% full at the beginning of your trip, or falls below this level during your journey, you get to benefit! 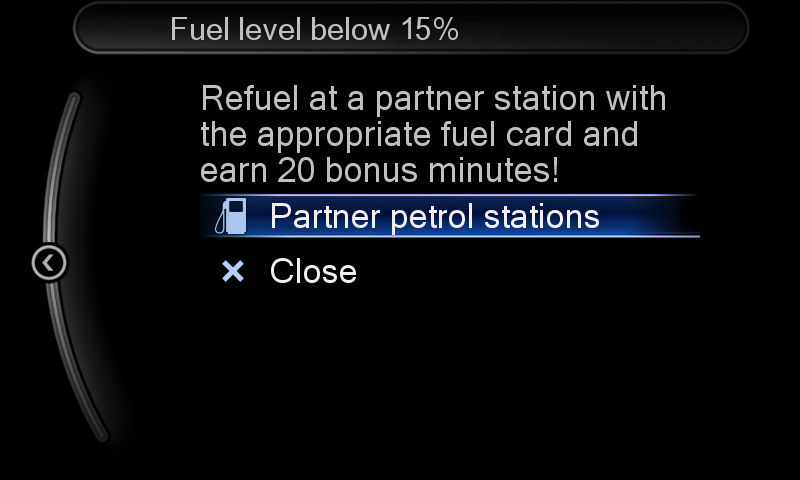 In this case, every customer who refuels in one of our partner petrol stations and drops off the car with more than 90% in the tank will be credited with 20 bonus minutes (with 3 months validity). All available ST1, Shell and Neste petrol stations will be displayed on the display in your car when you select "Special points of interest" from the menu. You can also locate the petrol stations using the app. Select "Refuel" and take note of the fuel card PIN, which you'll need when you pay. In both the BMWs and MINIs, the fuel card is kept in the central armrest and the app tells you the code.